Troop 1 has a very rich history in Brewster, Putnam County and The Boys Scouts of America. 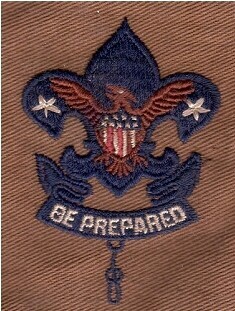 Our Troop was orginally register in October 1910, during the first year of Boy Scouting in the United States. Our leaders and scouts have helped shape our community and Scouting in America. This vault contains our valued collection of compiled Historical Documents and collected messages from past troop members. The story and history of the Scouting movement in Brewster is a reflection of Boy Scouting in Putnam County. Ward Hopkins was the first Boy Scout of Brewster and the argument can be made the first Boy Scout of Putnam County. It was his embracement of the movement in the summer of 1910 that started the organization rolling. He served as the 1st Patrol Leader (the Seneca Patrol Leader) thru out the Troops formative years. 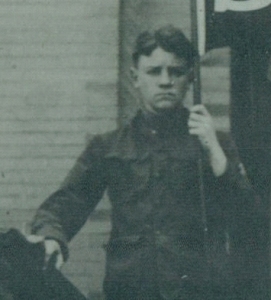 It was noted in the August 15th 1919 issue of the “Brewster Standard, that Army Air Corps Pilot 1st Lieutenant Ward Hopkins chose to spend his leave following combat in Europe (WW I) as Assistant Scoutmaster during Brewster Troop One’s annual summer camp at Vail’s Grove (Peach Lake). “Once a Brewster Boy Scout – always a Brewster Boy Scout”. (During Founders Day 2010, the community of Brewster honored one of their native son’s on what would have been his 96th birthday). Cecil Austen Bolam was Brewster’s first Eagle Scout. He rose through the ranks to command Brewster’s Troop One as their Senior Patrol Leader in 1930. He spent the summer before his senior year at the original Camp Read on Long-Pond in Mahopac, serving on legendary Scoutleader “Doc” Sowerby’s Staff. Upon graduation from Brewster High School in 1932, he entered the ranks of the US Navy as Seaman Apprentice. Two year later, he secured an appointment as Midshipman to the United States Naval Academy at Annapolis. This 185 pound Cross Country and Track ace’s exploits were such that he is still listed on Navy’s All- Time Cross Country letterman roster. Upon graduation and commissioning in 1938, Ensign Bolan began his career as a naval officer. In 1941, he qualified as a “lighter-than-air” dirigible pilot. His Combat career during World War II began by protecting the East Coast and North Atlantic on anti-sub patrols. He was then transferred to the Pacific serving as Gunnery Officer on the Light Cruiser Cleveland. During his tenure on the Cleveland, the ship supported numerous invasions, earning a Navy Unit Citation and 13 Battle Stars. In 1952, at the age of thirty-eight, he entered flight school at Pensacola FL, qualifying as a carrier based JET Pilot (during his career he logged 4000 hours as a pilot-700 at the controls of a Jet). Captain Bolam’s last two commands were the seaplane tender Currituck followed by command of the aircraft carrier Lake Champlain. The Champlain is well known as the recovery ship for the First manned Space Flight “Freedom 7”. She also participated in the blockade of Cuba and was the primary recovery ship for the “Gemini 5” Space Mission. Following duty on the staff of the Naval War College, Captain Bolam retired in 1963 due to ill health. Upon his death in 1966, he was buried with full military honors at Arlington Cemetery. This Brewster Native, always proud of having come from the “Hub of the Harlem Valley,” left a legacy from Tenderfoot to Eagle Scout-Seaman Apprentice to Midshipmen-Ensign to Aircraft Carrier Captain- Dirigible to Jet Pilot. As quoted in his Annapolis yearbook, “Bo” Bolam has given “his Podunk what podunks ask of their native sons.” He was a shining example of Brewster Determination and Pride. Murray Hamish Gardner was Putnam County’s Renaissance man from Brewster. Born in Hammond New York, on the 28th day of August 1863, he graduated from Hamilton College Class of 1884 (Phi Beta Kappa). He was ordained to the Ministry of the Presbyterian Church in 1892. He became Pastor of the Brewster Presbyterian Church in 1905. Reverend Gardner served in an abundance of capacities in Brewster, everything from substitute high school Professor, interim Principal, elected to the school board as a Trustee in 1926, and as School Director for Putnam County. He was also President of the Brewster Public Library for over 30 years. He served as the President of the Putnam County Child Welfare Organization, which he founded and is now part of the State Department of Child Welfare. During the First World War, he was our area’s Red Cross representative. Reverend Gardner was Brewster Troop One’s first Scoutmaster from its founding in October of 1910. In April of 1913, the Boy Scouts of America chose to appoint him our area’s first Scout Commissioner (of the “Harlem Valley District’). One of his first actions was to set up a Boy Scout Field Day at the Carmel Fairgrounds. It was well received with over 70 Scouts from Putnam County. Carmel, Patterson and Brewster Troops were represented. Reverend Gardner (wearing both his Scoutmaster & Scout Commissioner’s hat) organized Brewster Troop One’s third Annual Two week summer camp (July 1913) at Vail’s Grove (Peach Lake) and held what could be considered Putnam County’s first Camporee. Besides our Longhouse Troop from Brewster, Scouts from Yorktown and Bethel Connecticut attended. (Our Vail’s Grove and Peach Lake Boy Scout camping summer of 1913 is also mentioned in the “Boy’s Camp Book” by Edward Cave- Scoutmaster Mamaroneck Troop One). At a meeting of the Scout Council of The Boy Scouts of Brewster, the resignation of Reverend M.H. Gardner as Scoutmaster of Troop One was accepted with much regret. Reverend Gardner was then elected Honorary Scoutmaster of all Brewster Scouts (emeritus) and a member of the Scout Council. Other members of the council board elected are: Dr. R. S. Cleaver, Dr. E. R. Richie was elected chairman and James T. Danes was elected secretary. Reverend James Lewis Lasher was chosen as Scoutmaster. Reverend Gardner continued in this capacity until June of 1928, when Mr Kellerher of the National Council of the Boy Scouts of America attended a meeting at Southeast House. It was at this time that it was arranged for both Brewster Troop One and Brewster Troop Two to become affiliated with the Fennimore Cooper Council. H.H. Wells arranged for the $200 funds be raised for Troop One and Troop Two. Reverend Gardner then served as the (Putnam County) District 5 of Fennimore Cooper council Court of Honor Board President (note: this was the same position locally that Dan Beard held at the national level). He continued in this capacity until ill health forced him to resign. In August of 1939, Reverend Gardner resigned from scouting responsibilities. That month, he also resigned from his ministry in Brewster of nearly thirty-five years. He passed away Wednesday Oct 18th 1939 at the age of 77. Reverend Gardner’s impact on the community of Brewster and Putnam County goes without question. His influence on the Scouting Movement (not just in Brewster) is tremendous. The success of Scouting in Putnam County can be attributed to his efforts. The fact that Brewster Troop One still exist today after 100 years is a testimonial to his commitment. This was an adult leader who made sure that all the Scout Law’s were strived for. Not only did he have his Scouts out hiking and camping, but he facilitated intellectual discussions and debates at the Scout meetings through mock trials. His Scout was not only comfortable in public speaking, but also in the forest, on the playing field, and in the classroom. Three months after Brewster Troop One founding in Oct 1910, following BSA guidance, a Citizen’s Supervisory Committee was formed on February 3rd 1911. Its purpose stated, “In order to regulate and strengthen the Brewster Boy Scout Movement”. Its members included: Rev Lasher; Rev Westcott, Rev Reed, EW Addis (publisher); E.D. Standard; Frank Wells; Assemblyman John R Yale; C Ralph Diehl; Fred Hall; Principal Bennett; Frank O’Brien; George Kniffen; H.F. Underhill; C,. 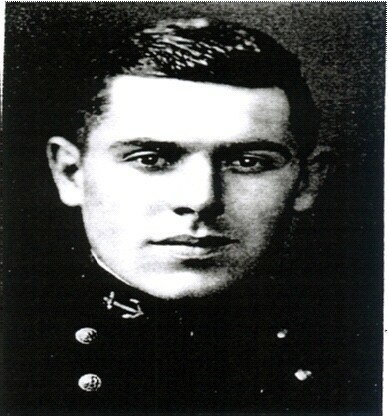 Elmore Smith; W.E. Maher; Arthur Wood; C.W. Griffith; P.F. Beal and J.D. Morehouse (all prominent individuals). 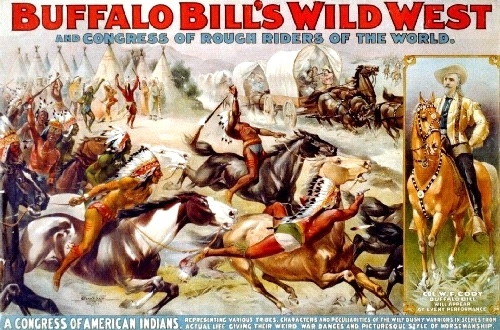 In both the May 1912 editions of the “Brewster Standard” and the”Danbury Evening News”, it tells of the “Brigade of Brewster Boy Scouts” meeting Col Buffalo Bill Cody. Over 40 boys traveled in seven automobiles to the Danbury Fairgrounds to see the “Wild West Show”. Colonel Cody made special recognition of the Brewster Scouts and afterwards met with and shook each of their hands. The boys were special guest of Assemblyman John R Yale. Original Troop OneScout and 1912 BHS Valedictorian William Stanley Day. 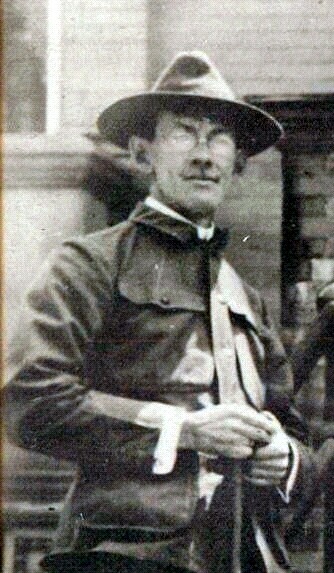 William Stanley Day was one of the original Scouts of Troop One. When he gave his speech as the BHS Class of 1912 Valedictorian, it was of no surprise what it would be on. From the “Brewster Standard” pg one June 28th 1912 – “William Stanley Day the first speaker of the evening, found his words easily and brought them forth well. His oration entitled “ The Modern School of Chivalry” sketched the underlying purpose of the Boy Scout Movement – manly and progressive in every sense of the word”. Brewster Boy Scouts Attend Scout Rally in NYC at the Seventy-first Regiment Armory under the auspices of the New York Council ( March 1913). Brewster Scouts at NYC Boy Scout Rally “Win Antelope Race” “Thirty three member of The Longhouse Troop attended the Rally in NYC. Brewster was one of 174 Troops attending (over 4000 Scouts) and won the “Antelope Race”. This outstanding feat was recognized in not just our local paper, but in all the New York papers including “The New York Times”. Brewster Troop One’s Permanent Camp and Lean-to at Joe’s Hill (Devils Den). In November 1913, Brewster Troop One established the Troop’s permanent Camp and Lean-to (remnants are believed to still exist) at Joe’s Hill at Devils Den. 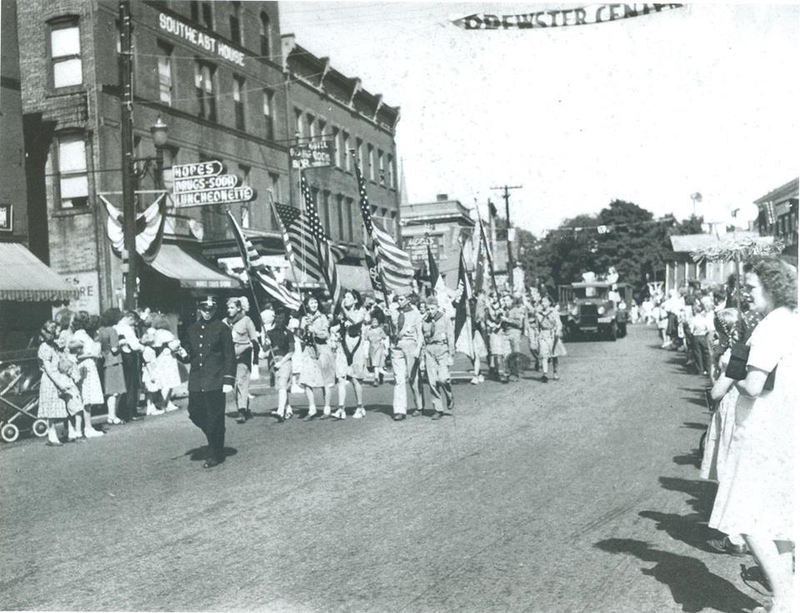 Boy Scouts and Girl Scouts Marching in Brewster’s Memorial Day Parade. From the June 5th 1914 “Brewster Standard”: Boy Scouts and Girl Scouts marching in splendid form (Brewster Girl Scouts for the first time). Brewster Boy Scouts host at the Seventh Anniversary ‘The Brewster Standard” Feb 16th 1917. “It wasn’t long after the national organization in 1910, of the Boy Scouts of America, that Longhouse Troop One was inaugurated in Brewster. The idea originated in the mind of Ward D Hopkins. (Note: 1915 Brewster Troop Two organized under Reverend J.C. Rawson). The Boy Scouts of Brewster entertained Carmel & Patterson Troops and 150 friends, including Girl Scouts at the Town Hall. At the Lion’s Club meeting held on Tuesday (Oct 31st 1930), Lion President Dan Brandon assured to the below named gentlemen that the “Boy Scout movement in this vicinity would receive the full support of the Brewster Lion’s Club”.